Home » Comics and Comic News » Stan Lee Is Dead. Long Live Stan Lee. The news today is that Stan Lee is dead at the age of 95. Don’t believe it. I’m sure much will be made of the fact that his physical body has passed. There will be weeping and mourning, with news sites and social media filling up with tributes and lamenting over the fact that the genius of comics has died. People will quite likely be shutting down over this, as if a close, personal friend of theirs is gone. I refuse to do that, because Stan is still here. I’m not sure exactly how I was introduced to Stan. When I was a kid in the early 1980s, I was hooked on two cartoons: the Spider-Man and His Amazing Friends and Incredible Hulk on NBC Saturday mornings. Unsurprisingly, I got into their comic book counterparts when I first discovered them in a drugstore on a shopping trip with my mom. The first Marvel comic that I can remember buying was Incredible Hulk #287 at a drugstore in the summer of 1983. I was hooked, and started getting Amazing Spider-Man and Marvel Team-Up shortly after that. My first Marvel Comic, from July 1983. If I remember anything about those cartoons, it’s that Stan narrated every episode in that masterfully cornball voice of his. Stan was a ham, but damned if he wasn’t an exciting ham. In retrospect, those cartoons were pretty silly, with ridiculous dialogue, canned music, and situations that can only make sense with comic book physics. I guess you had to be there, because my five year-old self wasn’t looking for Shakespeare. A guy who could stick to walls and a man who became a raging green monster was all the high literature I needed. I was an awkward, unpopular kid who wasn’t into sports, and elementary and high school found me pretty isolated from the other cool kids. You might think that comic books were unhealthy escapism, but they gave me a whole other, fantastic world where I could go when the real world got too tough. The Hulk and Spider-Man were my staple books, but in 1984 I discovered Marvel Super Heroes Secret Wars and was opened up to the larger world Stan created: the patriotic Captain America. The armored Iron Man. The mighty Thor. The weird, isolated X-Men. The familial Fantastic Four. And of course, all the terrifying villains like Doctor Doom, Doctor Octopus, Ultron, and the imposing, godlike Galactus. The average person might have viewed these as ink on paper, but they were very real to me and kept me going through the day. Stan opened up another opportunity for me in my young life. Sometime in the early 80s, I was in a K-Mart with one of my parents when I stumbled across How to Draw Comics the Marvel Way by John Buscema and, you guessed it, Stan Lee. Here was an opportunity to learn how Stan and his people made all those amazing comics. I insisted that my parents buy it for me. In the months that followed, I took reams of paper and tried almost every drawing technique in that book. For years after, I owed any art that I produced to that book. It was most definitely John Buscema’s techniques, but I equally recognize Stan’s writing and instruction from that book. John showed how Marvel art was so dynamic, but Stan explained why it was so dynamic. I never went on to become a great comic artist, but I learned more about comic art from that book than anywhere else. I still own that book. I bought a second copy for my daughter, the budding artist, who uses it herself. Over the years, my love of comics and the Marvel Universe just continued to grow, and Stan had a presence at every step (and he even appeared in many of the comics, becoming a character in his own world!). A new Spider-Man cartoon debuted in the 1990s, and Stan had the meta of meta appearances in the final episode. Nerd culture started to crack the mainstream. Stan had a memorable cameo in Kevin Smith’s Mallrats when he explained comics culture. In 2000, the ­X-Men debuted in the first major film of the comic book media age, and there was Stan in a cameo appearance. The “real world” which had long shunned comics as corny and childish was suddenly getting exposed to the magic and wonder of Stan’s larger world. Suddenly, everyone was paying attention to Spider-Man, Daredevil, the Fantastic Four, Iron Man, Captain America, and Thor, and in every movie, there was a Stan Lee cameo. Stan meets his number one creation. What was once fringe culture is now everywhere. Every kid in America today now has access to Stan’s creations in some form, and his franchise is as big as Disney…so we shouldn’t be surprised that the company decided to buy up Marvel. It’s everywhere now. Point being, when Stan Lee passed from this world, it didn’t show us that he was mortal. We learned long ago that Stan Lee is immortal. As long as we continue to read or watch the characters he created, he’ll be with us forever. 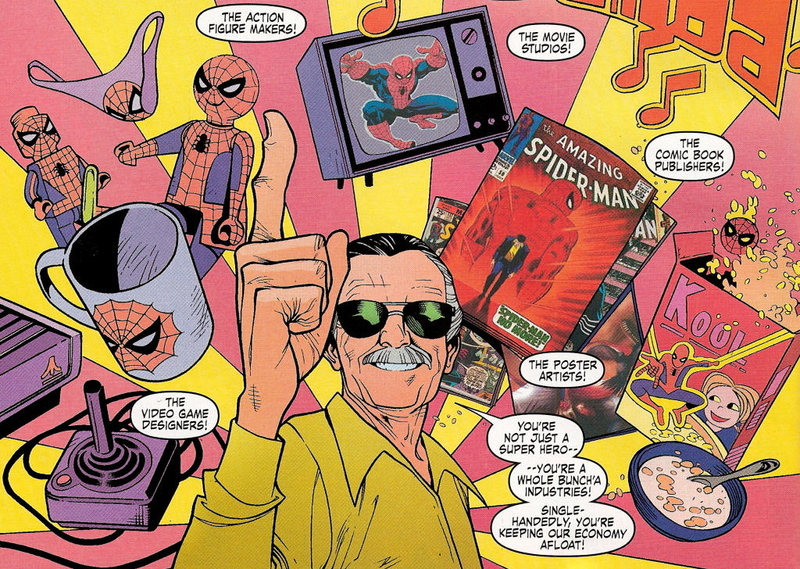 Every young kid who picks up a Spider-Man comic book today is keeping Stan Lee alive. Anyone who watches a Marvel movie or television show is keeping Stan alive. Any artist who draws a comic book because they learned the “Marvel style” is keeping Stan alive. Shakespeare wrote that “The evil that men do lives after them, The good is oft interred with their bones.” At a basic level, this means that we remember the dead more often for their evil acts than for their good. Stan Lee is the exception to that rule. He and his cohorts created an entire universe of heroism, where flawed men and women were imbued with fantastic powers and used them to make the world the place it should be. These characters and what they inspire will live long past the day that Stan Lee’s physical life came to an end. Mourn, but don’t mourn for long. If you want to bring Stan back to this world, all you need to do is open one of his comics. 2 Comments on Stan Lee Is Dead. Long Live Stan Lee. Damn. Stan Lee inspired so many people, and left such an amazing legacy. He’ll be sorely missed.